IBPS RRB PO & Office Assistant 2018 Preliminary Examination starts from 11th August, 2018. The IBPS RRB Exam 2018 is one of the most expected exam of the year. The reason for the consummate expectation is different from that of the others. The number of candidates attending the IBPS RRB PO & Office Assistant is high when compared to the other exams like SBI & Insurance Exams. The other important factor is that , no English section is there in the preliminary examination of the IBPS RRB PO & Assistant Exams. This is really a boost to the candidates as many of the aspirants couldn’t get the requisite marks in the English section and this exam is the best bet for the aspirants. 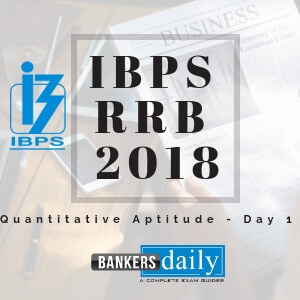 Since only few days are left for the IBPS RRB PO & Assistant Exam 2018 Preliminary Exam , we will be providing daily 20 Questions in Quantitative Aptitude & Reasoning Section to evoke the preparation mode. Aspirants can answer the Questions by commenting the answers for the Questions in the comments section. We will be providing the answers for the Questions @ 6:00 P.M everyday. Seven persons A, B, C, D, E, F and G are belong to three different countries viz., India, England and Australia. Each of them likes different fruits viz., Cucumber, Fig, Guava, Orange, Plum, Pomelo and Quince but not necessarily in the same order. At least two persons belong to the same country. A belongs to England. B and one who likes Cucumber belong to same country. Neither C nor G belongs to Australia. C and one who likes Quince belong to same country. D and one who likes Orange does not belong to same country. One who likes Plum and F belong to same country. Neither B nor C likes Plum. E likes Orange and belongs to India. Neither Quince nor Cucumber is liked by A. G likes Fig and does not belong to same country as one who likes Pomelo. Neither Pomelo nor Guava is liked by B. E and G do not belong to same country. Q.1) C belongs to which of the following countries? Q.3) Which of the following combinations is true? Q.4) Who among the following belong to the same country? Q.5) Who among the following likes Pomelo? Eight persons A, B, C, D, E, F, G and H are sitting around a circular table facing the centre, but not necessarily in the same order. Each of them reads different novels viz. Twilight, The cruel sea, The iron water, Solar lottery, Dark summer, Lucy and Linh, The alchemist, Last hope island. The one who reads Dark summer sits to the immediate right of E. E is third to the left of G. E does not read ‘The iron water’. Neither B nor H is an immediate neighbor of E. F reads ‘Solar lottery’ and sits third to the right of one who reads Dark summer. The one who reads ‘Lucy and Linh’ sits second to the left of E. The one who reads Twilight sits second to the right of the one who reads ‘The alchemist’. C sits third to the left of F. The one who reads ‘Last hope Island’ sits second to the left of the one who reads ‘solar lottery’. A is sitting exactly between H and F and reads The alchemist. B is sits fourth to the right of H.
Q.6) Who among the following person likes The cruel sea? Q.7) Which of the following combinations is true? Q.8) Four of the five are alike in a certain way based form the group find which is different from the group? Q.9) If all the persons are arranged in alphabetical order starting from A in clockwise direction how many person(s) retain their original position (excluding A)? Q.10) Who sits opposite to C? Z, P, J, Y, K, T and N are seven friends. Each of them has different types of bikes Dio, Duke, Activa, Hero Honda, Royal Enfield, Yamaha and Pulsar and the cost of each bike is Rs.55000, Rs.80000, Rs.62000, Rs.65000, Rs.90000, Rs.95000 and Rs.73000 but not necessarily in the same order. J has Hero Honda. The cost of Dio is Rs.55000. T has Yamaha. Cost of P’s bike is Rs.7000 more than Z. Cost of N’s bike is Rs.73000. Cost of Y’s bike is multiples of 16. P has Activa. K does not have Dio. Cost of K’s bike is 10000 Rs more than Y’s bike. Neither K nor N has Royal Enfield. Cost of T’s bike is more than Cost of J’s bike. K does not have Pulsar. Q.11) Who among the following person’s bike cost is Rs. 65000? Q.12) What is the average bike cost of Dio and Yamaha? Q.13) K has which of the following bikes? Q.14) Which of the following combinations is true? Q.15) What is the price of Duke? Q.16) How many such consonants are there in the above arrangement each of which is immediately preceded by a consonant and immediately followed by a vowel? Q.17) Which of the following is fourth to the left of the tenth from the right end of the above arrangement? Q.18) How many such numbers are there in the above arrangement each of which is immediately preceded by a consonant? Q.19) Four of the following five are alike in a certain way based on their positions in the above arrangement and so form a group. Which is the one that does not belong to that group? Q.20) If all the symbols and numbers from the above arrangement are dropped then, which of the following will be tenth from the left end of the above arrangement? Also Please attend this BLUE WHALE QUESTION (which is a combination of many topics and combined into a single one). This is a One Stop Solution for all your Miscellaneous needs. 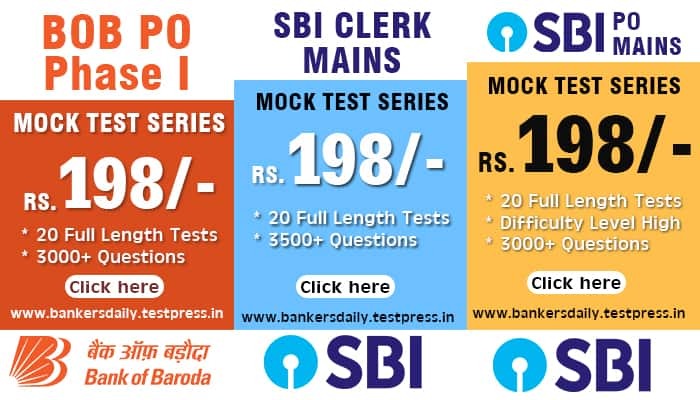 Get the FULL LENGTH MOCK TEST SERIES for SBI PO Mains 2018 , SBI CLERK Mains 2018 & BOB PO Mains 2018 from our Bankersdaily Store.